Miss Rena Bushing, Johnson Twp. 2. And balance to your partner. 4. And all chaw hay on the corner. b. The young people form a circle, with each girl at the right of her partner and all facing the center. One of the girls leaves the circle and dances around in the center during the singing of of 1. At 2, she swings her partner. 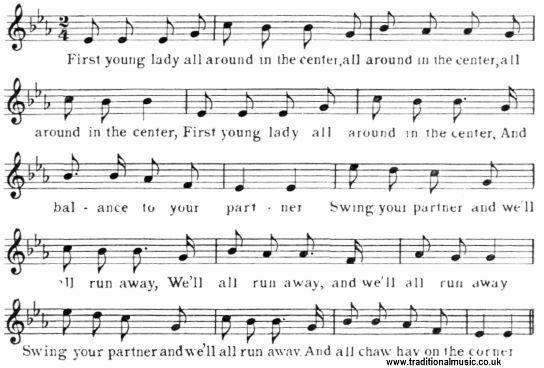 While singing 3, all partners swing and all promenade in a circle to the right (i. e., skip around in a circle, couple following couple) and all return to their original places, with the exception of the first girl. During the promenade she is at the left of her partner, and in the final formation of the circle she is also at his left. b. Directions for playing the games. c. Age of the game and the time of its popularity.